Shire at West Haven is a small gated community of luxury Orlando vacation rentals & villas to rent, located just off the Ronald Reagan Parkway in Davenport Florida and less than 15 minutes from Disney World. West Haven is a large development consisting of of 6 smaller communities. As you arrive at West Haven, you drive down beautifully manicured streets, expertly maintained throughout the year with new shrubbery & flowers for each season. West Haven is very close to the well known Champions Gates golf club and hotel, where you find numerous restaurants, shops and a Publix supermarket close by. The Shires is the newest of the subdivisions on the development, built around a small central conservation area. Visitors from the UK, it will feel like your home from home, with road names, Norfolk Drive, Essex Place, Suffolk Place, Dorset Drive, and Devon Drive to name a few! We have put together some information from our own experience, which we believe you may find of use to you during your stay in on Highgate Park. However, if you have any questions, we are more than happy to help you out. The best way we have found with the least amount of traffic is down the Central Florida Greeneway (Toll 417). It's a toll road, but worth every penny, especially after a long flight. From Orlando International (MCO) (less than $5 in tolls) head for the 417 SOUTH. From Sanford International, also head for the 417 SOUTH (less than $10 in tolls). Stay on the 417 toll road which eventually merges into the I4 West to Tampa - take exit 58 onto Champions Gate Blvd - stay on this road until you reach the intersection with Ronald Reagan Pkwy - turn right and follow road until the left turn into May Fair Blvd - at the end of May Fair Blvd turn left into Buckingham Drive and you will find The Shire down this road. There is no free shuttle service available to the parks from The Shire, but there is a very friendly and helpful taxi services available locally. There are numerous petrol stations nearby, but the closest is at Champions Gate. "Don't forget to lift the lever" announced loudly over the intercom !! (We found this out to our embarrassment on our first trip here). You can also buy gas refills for the BBQ from both petrol stations. The nearest supermarket is Publix (great value with an excellent choice & service), which is located at Champions Gate, which also has strip mall with a huge variety of shops, restaurants, takeaways and bars. 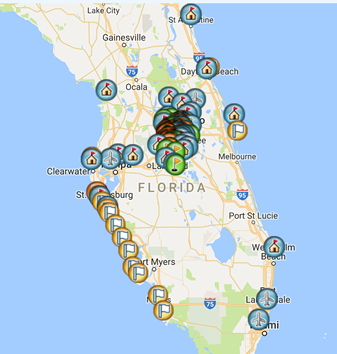 We have put together this comprehensive guide to all that is great in the sunshine state of Florida based on our experiences in visiting most of Florida since 1997. We have included all the vacation rental resorts we feature on our website along with local restaurants, shopping, Orlando theme parks, alternative Orlando attractions, golf courses, beaches and airports. The handy interactive map allows you to zoom in & out, click map markers to read individual details on what can be found at each map marker. We also have filters so you can show as much or as little detail as you want. If you have found any gems of your own which we have not listed, please let us know and we will happily add them to the map.